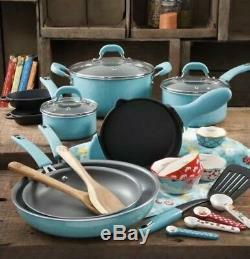 The Pioneer Woman Vintage Speckle 24-Piece Cookware combo set. 1-qt sauce pan with lid. 2.5-qt sauce pan with lid. 5.5-qt Dutch oven with lid. Hand wash wooden utensils and silicone sleeves. Cast Iron: 500 degrees F. Enameled Aluminum: 400 degrees F.
Glass lids: 350 degrees F. Only use plastic or wooden utensils when cooling or cleaning your enameled cast iron. Cast iron: Safe on gas, electric, halogen, glass, vitroceramic, and induction stove-tops. Enameled aluminum: Safe on gas, electric halogen, glass and vitroceramic stove-tops. 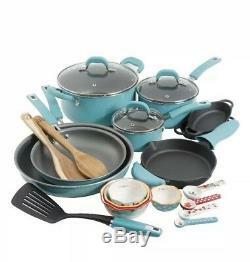 The item "The Pioneer Woman Vintage Speckle 24-Piece Cookware Combo Set Pan Pot Turquoise" is in sale since Tuesday, January 29, 2019. This item is in the category "Home & Garden\Kitchen, Dining & Bar\Cookware". The seller is "collviol" and is located in Fitchburg, Massachusetts. This item can be shipped to United States, Canada, United Kingdom, Denmark, Romania, Slovakia, Bulgaria, Czech republic, Finland, Hungary, Latvia, Lithuania, Malta, Estonia, Australia, Greece, Portugal, Cyprus, Slovenia, Japan, Sweden, South Korea, Indonesia, Taiwan, South africa, Thailand, Belgium, France, Hong Kong, Ireland, Netherlands, Poland, Spain, Italy, Germany, Austria, Bahamas, Israel, Mexico, New Zealand, Philippines, Singapore, Switzerland, Norway, Saudi arabia, Ukraine, United arab emirates, Qatar, Kuwait, Bahrain, Croatia, Malaysia, Brazil, Chile, Colombia, Costa rica, Dominican republic, Panama, Trinidad and tobago, Guatemala, El salvador, Honduras, Jamaica, Viet nam.